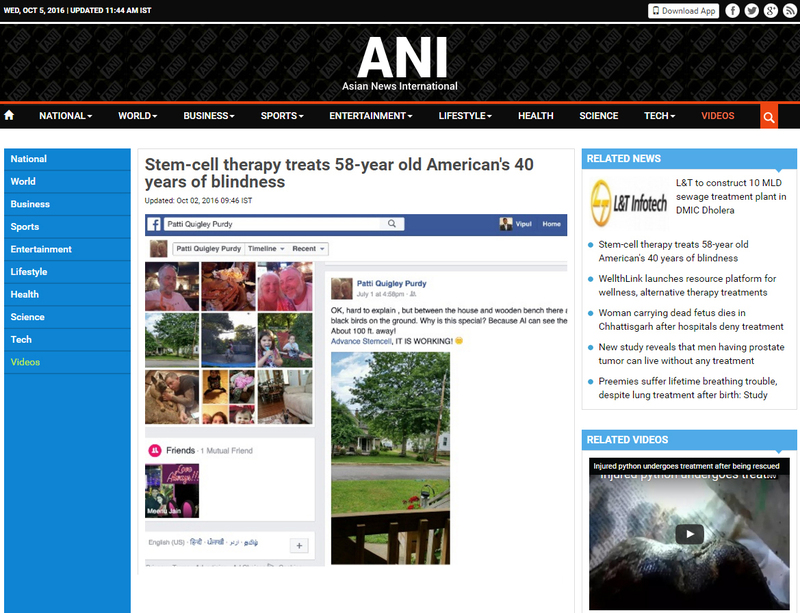 New Delhi [India], Oct. 2 (ANI): Stem-cell therapy, that uses stem cells to treat or prevent a disease or condition, is indeed a one to uproot different long-drawn diseases. Noida-based stem cells therapy solution provider, Advancells, has successfully improved the vision of a 58-year-old American National, Al Purdy, who was suffering from macular degeneration. The therapy has helped the patient, who had been legally blind for 40 years, experience significantly improved vision and become self-reliant. Al Purdy had been inflicted with macular degeneration, and had little hope of recovery until he decided to receive stem cell therapy from Advancells after thorough research. After explaining him the whole procedure via email, the session progressed enabling Al to initially see objects clearer than earlier. Later, he read several lines of the eye chart. Gradually, he was able to focus and see objects at a distance, along with being able to walk in the dark with a regular flashlight. Macular degeneration results in the loss of central vision of the afflicted person because the light-detecting cone photoreceptors of the eye stop working. Scientific advances in macular degeneration research have resulted in better understanding of what causes this disease, and an array of treatments that can slow down or stop the blinding effects of bleeding in the wet form of the disease. However, until recently, medical sciences had nothing to offer patients who have already lost their vision to this disease. The new field of regenerative medicine and of stem cell therapy, in particular, holds out the promise of replacing the retinal cells that die due to macular degeneration and of restoring some degree of vision to those patients. The skilled medical team at Advancells has been able to prove this method successful through the treatment of Al Purdy. The non-invasive therapy was performed jointly by Dr. Neha Sharma Kandhari, Sr. Consultant Ophthalmologist, IBS Hospital, Delhi and Dr. Mayank Jain, Sr. Consultant, Regenerative Medicine, Advancells.